Last week, when I had heard there were protesters asking people to boycott Manny’s Café, I chose to show my support by picking up dinner from there on my way home. 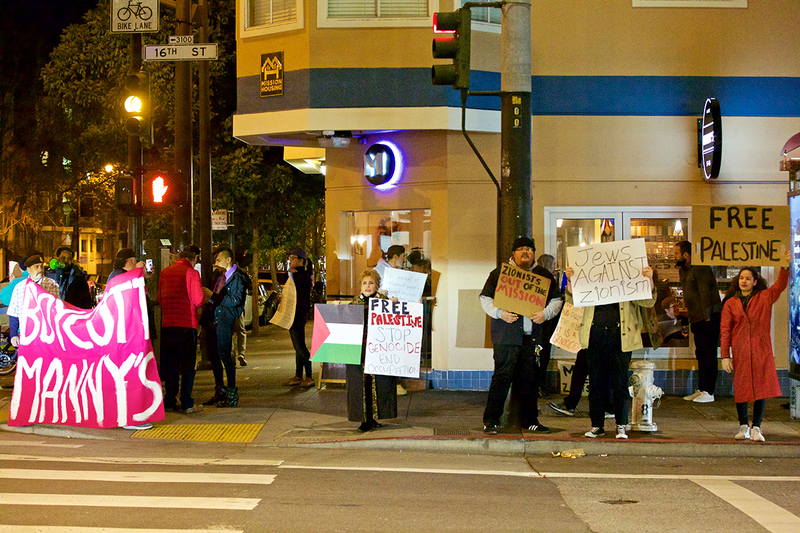 A “community café” in the Mission, Manny’s functions as a civic social gathering place to host discussions on community issues. It also houses a restaurant that serves food from a nonprofit that gives jobs to homeless people, a civil rights-themed bookstore where shelves are filled with books to browse or buy, and a programming space. “Civic engagement on the menu,” read the Chronicle headline when it opened. When I arrived the place was bustling – full of people. “They’ll be here in 15 minutes,” he said. Manny explained the need for in-person discourse to reduce the ‘corrosive incivility’ in his recent op-ed. And it goes beyond anti-Semitism. There’s the dispute in my synagogue when the family separation policy at the border was established last summer. Some wanted to take action saying it goes against Jewish values, while others wanted to keep politics out of the sanctuary. It’s the concern that many Jews have today – either about how they and other minorities are perceived, how democratic norms appear under threat, or whether growing partisanship is hindering open and respectful discourse in our society and within our community. People are on edge. Many feel isolated by their fear and alarm. The world and the country seem angry. Public rage rarely ends well for us. Coming together in challenging times is a strategy of resilience. It is among the reasons the Feast of Jewish Learning began 18 years ago as a “Night of Jewish Unity.” The idea was to utilize Jewish learning to bridge all sorts of divisions: religious denominations, politics, language, ethnic origin, and more, with the thinking that if we gather to learn together, perhaps it will help us discover what binds us. Not to paper over our differences, but rather to appreciate that we can be one people despite them. As tribalism grows in America, the opportunity for us to learn together, talk with one another, share our diverse voices and our connections, with respect and love, is a precious thing indeed. I think this is why so many people love this annual gathering. And in times such as these, it’s more important and compelling than ever. The Feast of Jewish Learning, Toward a More Perfect Union: Jews & America brings together hundreds of locals to study and discuss the state of our union with America. It is an evening of community, connection, and learning. We’ll end Shabbat and start the week with a communal Havdalah service, then break into two sessions of more than a dozen class choices each. Participants are invited to stick arounf for an After Party to shmooze, share what you learned, compare notes, and continue the conversation over beers, soft drinks, and snacks, all free of charge.